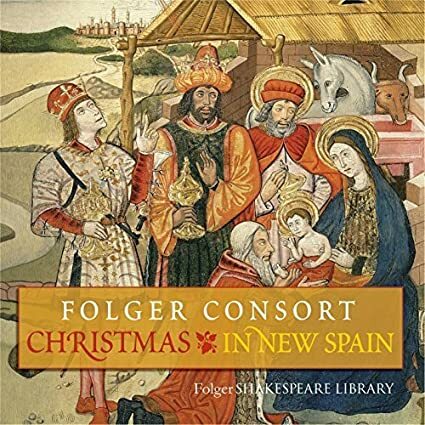 From the solemnity of Thomas Tallis, to rare first-time recordings of composers famous and obscure, to early 17th century Bohemia, we will celebrate the Feast with our 35th annual Christmas show. NOTE: All of the releases on this program are from recent recordings of material for Christmastide. 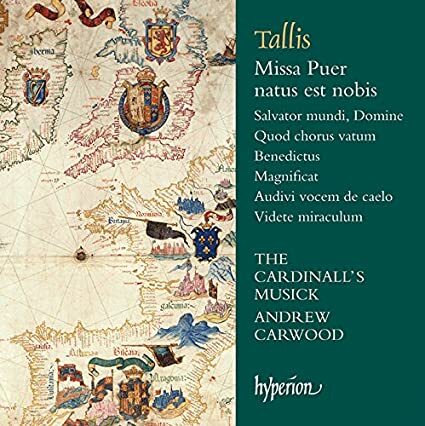 I. Tallis: Missa Puer nobis est natus (The Cardinall’s Musick/Andrew Carwood). Hyperion CD CDA 68026. By 1600 there were European-style cities in Mexico and Peru, the most important parts of Spain’s colonial empire. Elaborate musical establishments were formed at the major cathedrals of Mexico City, Puebla, Lima, and Cuzco. Puebla Cathedral, as ornate as many in Europe, is a good example of the larger musical organizations of New Spain. Accounts document how readily Native Americans took to Spanish church music. Many of them became proficient singers of Gregorian chant and polyphony, of Gregorian chant and polyphony, and they were skilled in the construction and playing of European instruments. The Cathedral Cappella by 1650 consisted of 13 adult singers and as many boys. All but two of the men were also paid to double on various instruments. Apparently, Mexican bishops had no qualms about the use of harps, viols, shawms, trombones, and other instruments in church. We open and close this recording with sacred pieces composed for these cathedrals. In between we have instrumental music, often based on the work of two Spanish guitarists with links to the New World. Many New World churches did not have organs, so the fundamental harmonies of 17th-century music were often provided by harps and other instruments. Harp, guitar, and violins were prominent, and we appropriately add flutes, viols, dulcian, and lots of percussion. There are also Christmas villançicos–much less formal pieces that often use Native American and black/Spanish dialects. They are quite different from anything being composed back in Spain. The CD’s featured works—most of them recorded here for the first time—are by the marvelous, rarely heard Adam Michna. Other Bohemian composers include Capricornus, Funck, Rovenský and Jan Josef Bozan. From the first track to the last, the vocal music explores the most cheerful portion of the church year—Advent and Christmas—with interspersed viol consort pieces. The music is a half-century before J. S. Bach; and it brings to life works from 17th century Bohemia across a range of moods and both courtly and popular forms. An opening Mass and a Sonata, and in the middle a dance-music Suite, are complemented by sweet carols that then alternate with religious pieces, an Alma redemptoris Mater, an Adesto multitudo coelestis exercitus, and a Magnificat. The CD was recorded at the St. Michael’s Episcopal Church, NYC. Detailed notes explain musical contexts and who the composers were: Adam Vacláv Michna, Johann Michael Nicolai, Michael Praetorius, Samuel Capricornus, Vacláv Karel Rovensky, and David Funck (who wrote “delicate baroque dances that could have been played at a court ball or banquet” but who was—you’d never know it from the music—“unstable and dissolute”; he was “forced to flee from a girls’ school in Upper Franconia where he worked, and was found dead shortly thereafter”). This is the product of collaboration, between The Teares of the Muses (The New York University Collegium Viol Consort), soprano Kathleen Cantrell, and the Ghostlight Vocal Quartet. Teares of the Muses’s Director Margaret Panofsky played first treble viol and first bass viol, directing from the chair; Collegium musicians are Caroline Marris and Christina Brandt-Young (treble viol and bass viol), Jeremy Brandt-Young and Carlene Stober (bass viol); and John Cantrell (organ and percussion). Panofsky selected the music, provided the notes, and did considerable musicological research to ensure authenticity but also applied some creative interpretation to the carols. Panofsky wrote and performed the treble variations for the various pieces. The timbre is soft and sweet, but serious and soulful; and richly resonant, from being performed at St. Michael’s. Cantrell's voice is very special, catching just the feeling of the old music, and I like how the Ghostlight Vocal Quartet harmonizes with her sound. The treble viol playing on the first two carols, by Michna, is gorgeous; the treble viol's voice and Cantrell’s voice merge and then play off wonderfully. Same for the three later Michna Christmas Carols. The first of them, "Zvani...," has a perky plucking motif and a sort of cheerfulness. The one next after is nicely cheerful too, yet mellow. The viol playing is sublime, rings out just right; the music between second and third stanzas is a nice little surprise for the listener. The Funck Suite in A Minor feels elemental, as it moves from walking to running and then dancing; and you can hear the intention of it being happy, and the little Ballo ends it sweetly! The Capricornus is a good piece to show off; the CD’s notes say the choice to combine treble viol and soprano is anachronistic, but it works very well in how the singing and viol play off each other; I like this piece a lot. Also the Rovensky arrangement, with the repeated bouncy little same notes, is tonally thoughtful and sweet, and the viol just sings in the slow part near the end. Michna's Magnificat is simple but rich (and it is nice for Cantrell to be able to relax from Czech into Latin); Cantrell and the Ghostlight team are very good together here. The final three carols close the whole in a lively brio, as joyful as it seems possible to make this music be. My favorite is the last—it dances, the viols are singing, the poem is witty as well as sweet, and the composer has caught the somewhat sassy spirit of the words as well as a happy cheerfulness that might, for the end, be called joy! 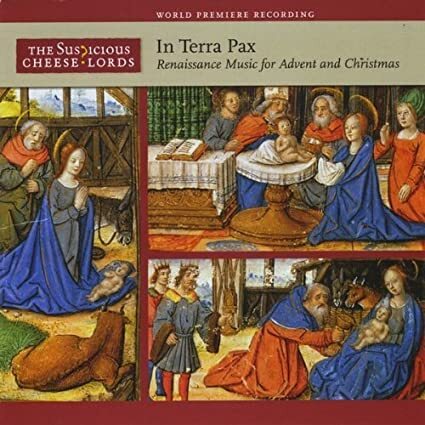 In Terra Pax is the Cheese Lords' fourth CD. It was recorded at the Franciscan Monastery in Washington, D.C., and produced by Tina Chancey of Hesperus. This is the first Cheese Lord CD not to focus on work of a single composer. This recording features many previously unrecorded pieces, including works by Jacob Handl, Leonard Paminger, Thomas Crecquillon, Gregorio Turini, and others. A highlight of the CD is the first-ever recording of Palestrina's Missa O admirabile commercium.